I couldn’t sleep so I went to the gym this morning at opening, which is 5 a.m. 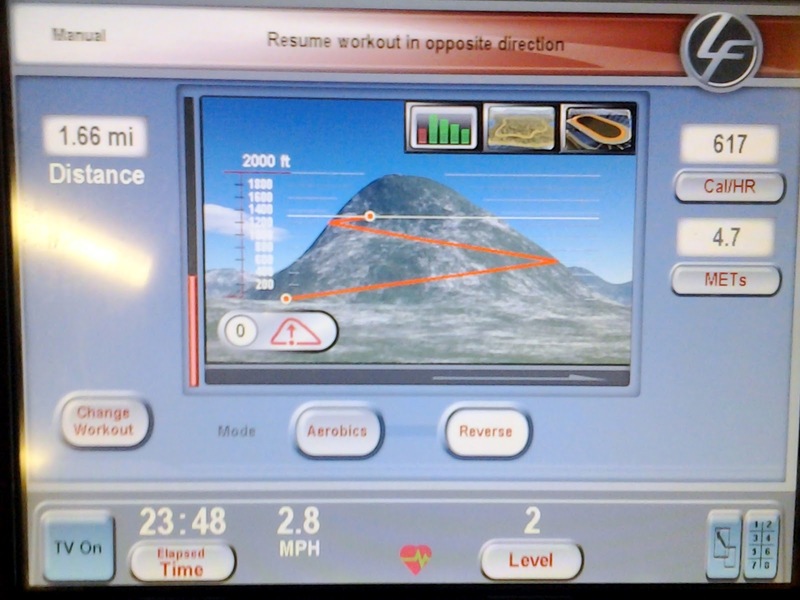 I got on the Elliptical machine and tried a new program which simulated going up a mountain. Every so often, the prompt on the screen would say “Prepare to stop”. Several seconds later, the prompt on the screen would change to “stopping..” and the pedals become almost unmovable. Next, I was prompted to “resume workout in opposite direction”. The first time, I waited until the pedals stopped me and went I was prompted to resume workout I almost broke my neck trying to change my footing. The trick, it seems, is to actually slow down when you are preparing to stop. Once, you actually get to the stopping phase you can readjust your footing and prepare for the next climb. Visually (and symbolically), as seen in the screen capture to the left, it all starts to make sense as you get closer to the top of the mountain. There is no such thing as a straight road to a destination or to the top. Knowing when to slow down is as important as the “going” phase. It is when you slow down that you discover what direction you should go next.